For use in ethernet enabled serial management. Console Server: telnet/ssh interface with ldap/ladius authentication and per-port user-auth. 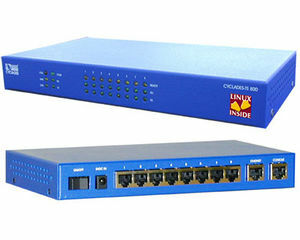 Can connect to 8 consoles/serial/rs232 ports. We can use it to control the 3xBaytech and 2xRPB+ power-relays. The 3 remaining ports could be used for the led-bars and other applications. This page was last edited on 13 October 2013, at 04:17.